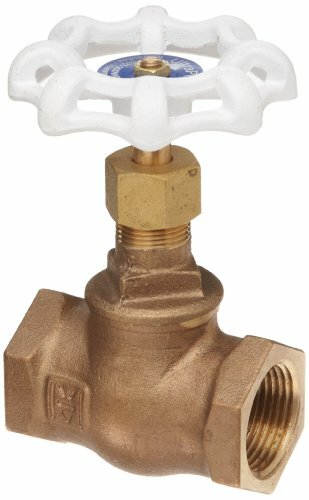 This Milwaukee Valve UP502 series inline bronze globe valve has a threaded bonnet, lead-free construction for use with potable water, rising stem, bronze disc, and female National Pipe Taper (NPT) threads on both ends, and is used to control flow (throttling) in a pipeline or water plumbing system. The valve body and disc are constructed of American Society for Testing and Material (ASTM) B584 bronze for strength and corrosion resistance. This valve has maximum pressure ratings of 300 pounds per square inch (gauge) (psig) for water, oil, and gas (WOG). It has a threaded bonnet for tight assembly and reduced risk of leakage, and female NPT threads on both ends for connecting to male threaded pipes. This valve meets standard Manufacturers Standardization Society (MSS) SP-80 for quality assurance and is designed in accordance with the requirements of California Assembly Bill 1953, Vermont Senate Bill 152, and U.S. Senate Bill S3874 which limit the amount of lead in plumbing fixtures that come in contact with water intended for human consumption. This rising stem globe valve is for use in various pipeline or water plumbing systems. Globe valves control flow rates in a piping system by the lift of a vertical stem and disk, which must be turned to open and close the valve. A seated disc extends into the center of the valve to act as a plug to restrict or open the flow path, depending on how tightly the valve stem is turned. The stem on globe valves can be either rising (moves up as the valve opens) to indicate if the flow is on or off, or non-rising (stem height remains constant when the valve is either open or closed) for use in small spaces. Globe valves are used in various water, gas, air, and steam piping systems that require frequent throttling operations.